Like most I am sure we are all aiming to be more organised and what better place to start than your handbag. I believe in being prepared for just about every occasion and with that in mind I have gathered together my day to day necessities in the hope that I can spur some on with being a little more formulated for the year ahead. Hand Sanitizer - Yes I am a slight germaphobe but I really do believe that everyone should have a bottle on their person at all times, especially if you use public transport or live/work in the city. Think about how often you touch various surfaces and then your face and then imagine how many other people have touched said surfaces before you? Yuck. Keep your hands clean people that's all I'm saying. Facial Wipes - When it comes to wipes I am not fussy as I seldom use them on my face, they are merely in my handbag for just in case occasions aka being caught in the rain with smudged mascara. I also use them with antibacterial hand gel to wipe down surfaces if needed. Deodorant - A small roll on or spray deodorant always comes in handy especially in the warmer weather. No-one wants to be sweaty or smelly do they? I jest but I think we all like to feel fresh and in my opinion deodorant is a quick and easy way to do so. Small Bottle of Perfume - I like to pop a sample or rollerball perfume in my bag (Sephora is the best place to stock up) for a little fragrance pick me up every now and then. If like myself you cart around a sizeable handbag you may find the likes of a Travalo (fragrance atomiser that you fill with your favourite fragrance) a good investment. Hair Ties - Admittedly if you have short hair then there is no need to stash away a few hair bands in the bottom of your bag but those with longer hair will agree that you can never find a hair tie when you need it. Personally I feel lost without a hair band or two, lord knows a top knot hides a multitude of hair sins aka windswept and interesting. Kirby Grips - Growing out a fringe or layers? A stray piece of hair that won't lay flat no matter what you do? Kirby grips to the rescue. Much like hair ties you can never find a kirby grip when you most need one, so keep a few in the bottom of your handbag and you'll forever feel smug, I know I do ha! A hair brush - Typically I have a mini Tangle Teezer at the bottom of my bag but annoyingly I have misplaced mine and have not got around to re-ordering one. For the moment I have a cheap and cheerful, fold away brush which actually kills two birds with one stone - it contains a mirror which always comes in handy more often than not. Lip Balm - I think the vast majority of us consider a lip balm a staple product - one to keep lips moisturised and keep chapped lips at bay. Although not photographed I do also like to keep a tube of Blistex Relief Cream in my handbag as it helps heal any chapped skin around the mouth and on the lips. I also have a friend who swears it heals cold sores, I don't suffer from them personally but perhaps something to keep in mind? Now if only I could vow to gather together all the above essentials and pop them into a make-up bag or such, then I'd really be organised! Great things you hold in your bag! I always have a hand sanitiser & a mini perfume in my bag. I don't have a lot of space in my handbag but I do like to keep a lip balm and a roll on deodorant in warmer months! Great handbag essentials, don't blame you with the Hand Sanitizer, an essential when you use public transport!! Great post! My handbag has the same essentials + some pain killers, since someone always is in need of those. Happy holidays! 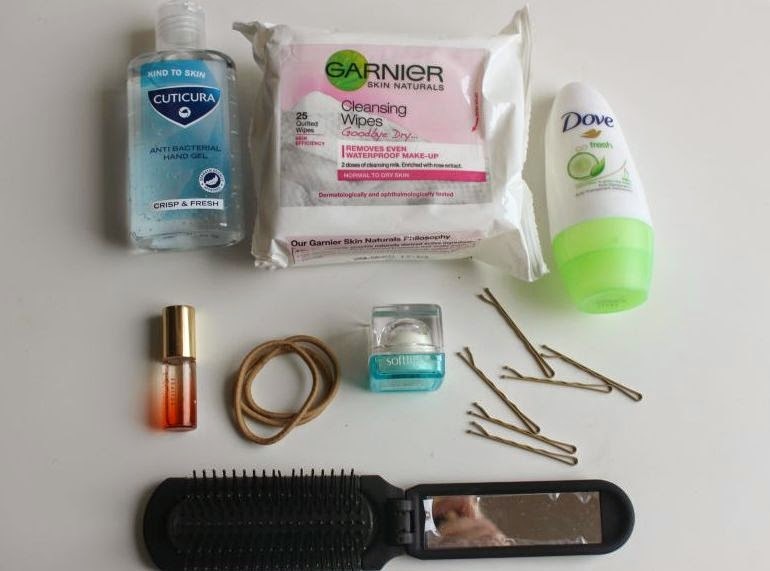 Facial wipes, hair ties and bobby pins are a must!! Gotta have hand sanitizer I agree it's a must have! Always take it on holiday with me too! Germaphobe here also! If I carry face wipes I always end up using them on my hands instead! Always useful stuff! I really like the Carex antibacterial hand wipes if my hands are sticky or particularly grimy when I travel up to London. And oil blotting sheets - a life essential. My bag is usually littered with numerous lipsticks, lip liners and rollerball perfumes! The mirror/hairbrushes are so handy aren't they! Love carrying around the mini-perfumes too! I got a great set from Victoria Secret! I agree with all of these completely! I have ran out the door in a hurry and realise I haven't applied either perfume or deodorant, so they're always great to have on you. I really need to get a small brush for my handbag. I feel like I always need one and never have one handy. Have a happy New Year! Can't live without most of these products. I do love a proper brush but these fold away ones can be so so handy. Haven't had one in years and like yourself I have misplaced my tangle teezer. Must grab one for on the go taming of the windswept beast I call my head.